Redditors have taken to flooding their platform with Winnie the Pooh and Tiananmen Square pictures in an apparent protest against the news that Chinese tech company Tencent will invest $150 million in the site. Reddit’s deal with Tencent, one of China’s largest arms in censoring content flagged by the government, is reportedly part of the site’s objective to raise $300 million to support its operations. Since TechCrunch reported about the deal on Tuesday, many Redditors have expressed fears about censorship. Reddit, known as the “Front Page of the Internet,” has 330 million active users but still can not be accessed in China. It is also worth noting that Tencent is specifically in charge of blocking, blacklisting and preventing internet access to certain groups, sites, and information in the country, including the banning of Reddit in China. The Chinese government has been infamously known to block certain websites and specific content, including references to the 1989 Beijing square massacre, alleged persecution of the religious group Falun Gong and the Winnie the Pooh character, among others. 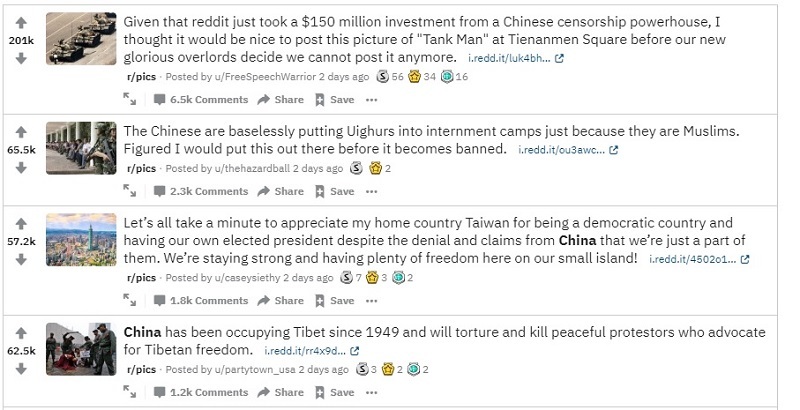 Numerous threads and memes criticizing the investment have since emerged on the site, with many Redditors expressing concern that Reddit would soon clamp down on freedom of expression due to Chinese influence. “Reddit is now funded by Chinese investors, so let’s remember that President Xi Jinping is so insecure in a meme that he banned Winnie the Pooh nationwide,” Redditor kproxurworld wrote. The Chinese government began to block images of Winnie the Pooh in 2017 when Chinese netizens started sharing numerous memes comparing Xi Jinping with the cartoon character. “Given that Reddit just took a $150 million investment from a Chinese censorship powerhouse, I thought it would be nice to post this picture of ‘Tank Man’ at Tiananmen Square before our new glorious overlords decide we cannot post it anymore,” Redditor FreeSpeechWarrior wrote. “A lot of people seem to think it’s a majority buyout for some reason,” user Lunariel pointed out. Regardless of how much influence Tencent will have in Reddit going forward, it’s clear where Redditors stand when the topic of censorship becomes even a slight possibility.